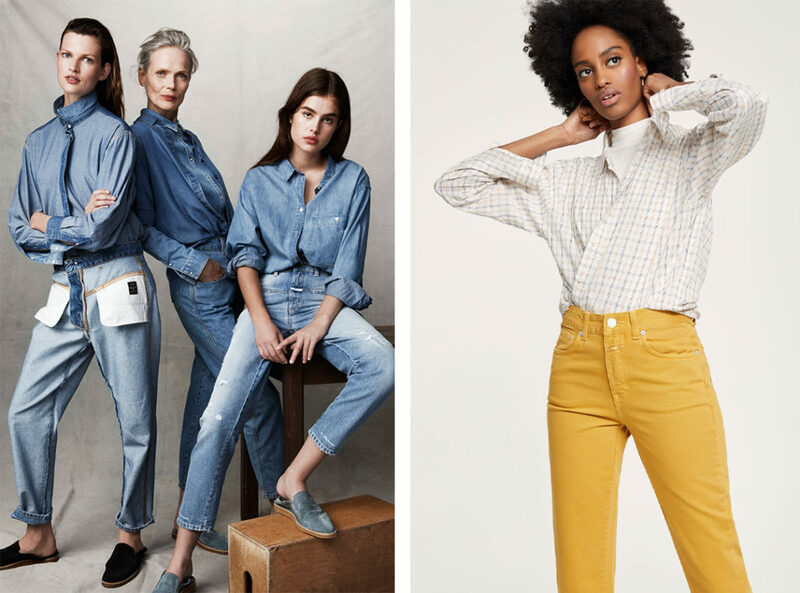 While their history is compelling, many denim brands exist today, and it can be overwhelmingly difficult to sift through the options. 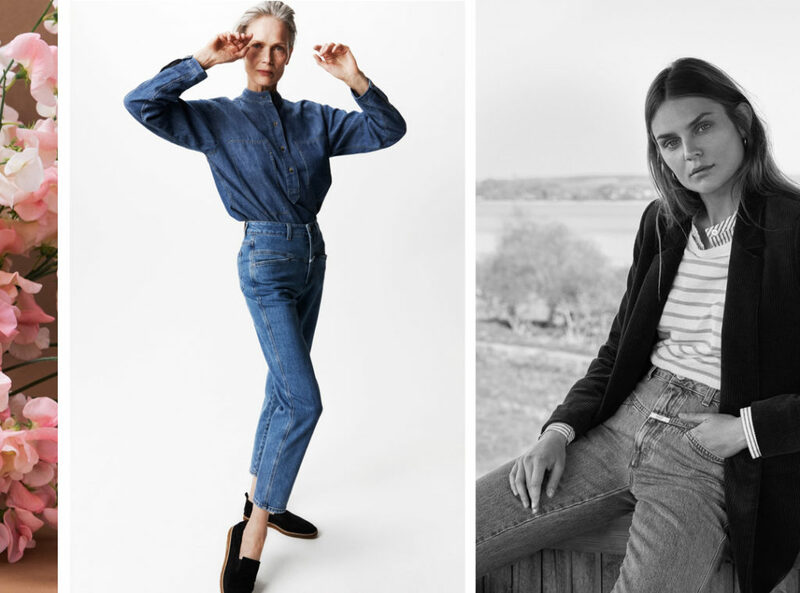 Finding the perfect pair of jeans is no easy task, and it’s not always the most uplifting. But there’s no better feeling than finally discovering your perfect fit, and we’re here to help. It’s our belief that Closed jeans have the diversity to fit many unique styles, lives, and body types. Rachel (Customer Service Team) loves Closed for the colorful washes, essential for spring time. 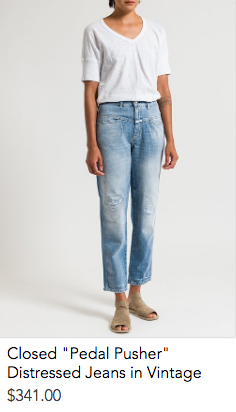 She finds the Baker Cropped Narrow Jeans to be supremely flattering and comfortable, with a healthy amount of stretch and the perfect tailoring. It is also important to her that Closed is actively striving for an eco-friendly approach in an industry that is characteristically wasteful. Jessie (Director of Stores) prefers the high-waisted styles. She loves how these fits are a true high-waist, more so than others on the market. She also admires how each season Closed produces new specialty cuts and always offer a variety of washes, making them a dependable brand. 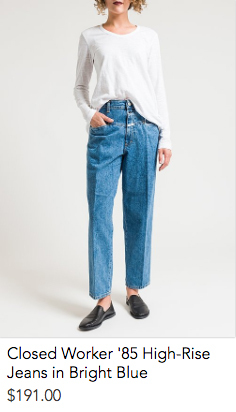 Tina (Sales Associate and Merchandising Manager) says the cut of styles such as the “Pedal Pusher” reminds her of a vintage aesthetic, bringing her back to when denim jeans were first created. 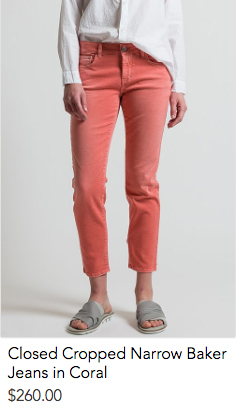 They are comfortable and flattering, sitting perfectly on the hip and cropping right above the ankle. She believes there is truly a style for everyone, from the fashionista to the more conservative denim-wearer. 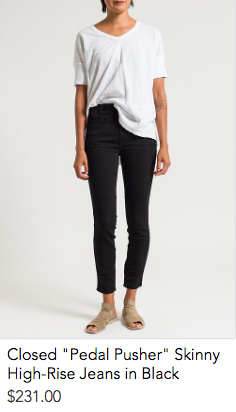 Rebekah (Web Sales Coordinator) normally doesn’t wear jeans because she finds them uncomfortable, however for Closed she makes an exception—especially for the classic Skinny High-Rise Jeans. Rebekah shops for her body, and believes this style suits her straighter silhouette and accentuates her long legs. She exclaims, “I think they have the right combo of stretch and stiffness so they don’t look like ‘jeggings’! Heaven forbid!” She also notes that their colors and textures are tastefully designed, and they hold their shape and wash.
Katie (Product Marketing) is a fan of Closed because they are not only flattering in color and cut, but they also run true to size—eliminating the frustrating guessing game that typically comes with trying on jeans. She loves the Worker ’85 High-Rise because they cinch and flatter the waist, and have a fashionable wide leg that is exciting to style. Discover the full collection of Closed on our website.